Made with corn, oats and wheat, this is the iron man food. Containing 10 essential nutrients that help provide you with energy throughout your day. A source high in protein, calcium and iron as well it contains B1, B2 & niacin. You only get what you put in! Cereals (46%) (Wheat Flour, Oatmeal, Maize Flour), Sugar, Wheat Protein, Maltodextrin, Molasses, Oat Fibre, Salt, Minerals (Calcium Carbonate, Iron), Barley Malt Extract, Raising Agent (Potassium Bicarbonate), Flavour, Natural Colours (Paprika, Turmeric), Vitamins (Vitamin C, Niacin, Thiamin, Riboflavin, Vitamin BE6, Folate). 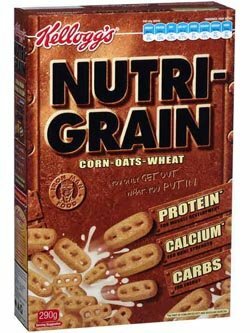 I had this amazing fabulous Nutri-Grain protein cereal whilst on holiday in Australia. This is the best tasting cereal ever. I just wish I could purchase them in my weekly shopping. I ate them every day on our two week holiday. They are scrumptious. My Australian partner loves them and so does my 14 year old dog. I do not know of any other ceareal that has tumeric in the ingredients. This is so good for you. Tumeric has powerful anti-inflammatory benefits. Nutri Grain cereal not only has lots of health benefits but also tastes fantastic. Best cereals ever! !shame can't get in uk!! This is the best cereal i have ever tasted, nothing compares to it! We grew up with Nutri Grain for breakfast. Now our 3 kids are huge fans too! My son is a really fussy eater but he can't get enough of these. I grew up on these, and i cannot find them anywhere.. These are what champions eat for breakfast! There is o other cereal out there that gives the same crunchy sweet taste..